A proposed domed stadium for the Brooklyn Dodgers, designed by Buckminster Fuller, was to replace Ebbets Field for the Brooklyn Dodgers to allow them to stay in New York City. The Dodgers instead moved to Chavez Ravine in Los Angeles. First announced in the early 1950s, the envisioned structure would have seated 52,000 people and been the first domed stadium in the world, opening roughly a decade before Houston's Astrodome. The stadium, in Fort Greene, Brooklyn, would have been located at the northeast corner of Flatbush Avenue and Atlantic Avenue, on the site of the Atlantic Terminal. It would have cost $6 million to build and been privately financed. It was never built. The general area eventually did become a sports venue, because Barclays Center was built across the street to the south from the Atlantic Terminal, in neighboring Pacific Park. The Dodgers were playing at the 32,000-seat Ebbets Field. 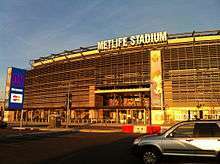 Feeling that the stadium was too small for their needs, they wanted to move to a newer, more modern facility. Dodgers owner Walter O'Malley wanted to exploit new revenue streams to capitalize on the rabid fans of the Dodgers. O'Malley commissioned Norman Bel Geddes about renovating Ebbets Field and first proposed a dome. He also talked to Buckminster Fuller to design a domed stadium. New York City Construction Coordinator Robert Moses wanted to utilize open space in Flushing Meadows, Queens and build a city-owned stadium there for the Dodgers. This plot of land was eventually occupied by Shea Stadium and later, Citi Field, the home of the New York Mets. Moses also opposed the location of the domed stadium since it would have caused significant changes to the subway system. The source of debate today, the stadium proved to be an important reason for the Dodgers to leave Brooklyn in 1957 and settle in Los Angeles. 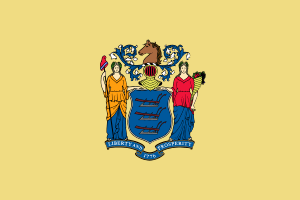 Some think O'Malley purposely proposed a stadium that had little chance of being built and that he privately negotiated with the city while publicly touting the merits of the domed stadium. Others suggest that the domed stadium failed because of Moses' uncompromising personality. The Atlantic Terminal Mall now stands on the land where the stadium would have been built. 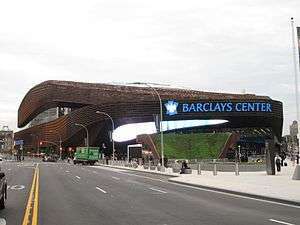 Adjacent to the Atlantic Terminal, in the new Pacific Park development, is the Barclays Center, where the Brooklyn Nets began play in 2012-13; they were joined by the New York Islanders in 2015-16. ↑ "Walter O'Malley". Retrieved 2007-02-14. 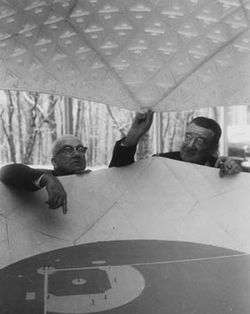 In November 1955, R. Buckminster Fuller and Walter O’Malley peer inside a model of what would have been baseball's first domed stadium, built in Brooklyn years before the Houston Astrodome opened in 1965. ↑ "Brooklyn Dodgers: The Ghosts of Flatbush". HBO. Retrieved 2007-08-21. You're in a room with Hitler, Stalin and Walter O'Malley and you have a gun with two bullets: Who[m] do you shoot? And of course the Dodger fans would say, 'You shoot O'Malley twice.' ... Walter O'Malley is down there in the seventh ring of Dante's Hell on the list of the most vile people of the 20th century. 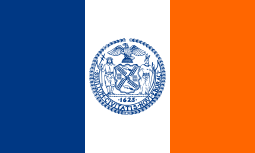 Note: Others defend O'Malley's move, blaming Robert Moses and other New York City officials.